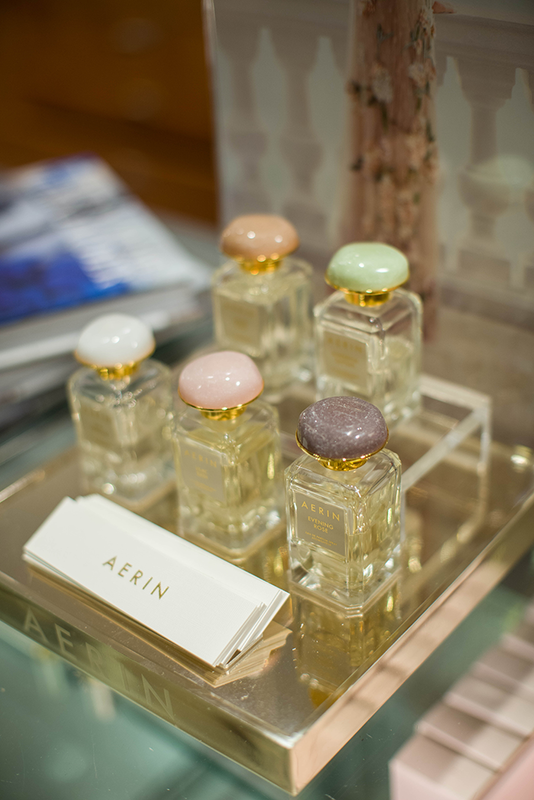 If you saw my sneak peek on Instagram, you know that on Thursday I was invited to meet and interview the beautiful Aerin Lauder: granddaughter of Estée Lauder, and founder of the home and beauty company, AERIN. Not only is her product gorgeous and worthy of any woman’s wish-list, she was so lovely to chat with – so genuine and sweet! All of her products would make great holiday gifts, like this Rose Lip Conditioner (stocking stuffer) or Aerin’s favorite scent, Ikat Jasmine, which I tried out for the first time yesterday – trust me, this stuff is liquid gold. Check out some pictures and my interview with her below, and be sure to shop her incredible collection online at Neiman Marcus! 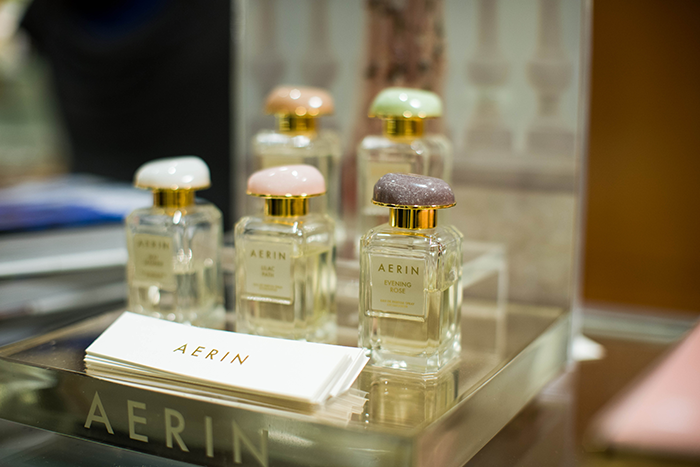 Thanks again to Aerin and the Estée Lauder team for including me in the Dallas fragrance launch! The Style Scribe (TSS) // I love that although you come from a well-established, successful family business, you broke out on your own and created your own empire. What was your inspiration for creating your namesake company? Any advice you could give to hopeful entrepreneurs? Aerin // I think there is something very important about following your dreams and following your passion. I’ve always loved beauty — it’s my heritage, it’s in my blood — but at the same time I also love home. I showed a video this morning talking about how home has been such a big part of my life, whether it was my dollhouse as a little girl (it was my favorite toy) that I used to rearrange for hours, the different rooms, and now then translating that into being a mother and wife and living in my home. The idea of the book is beauty and home where you can take those different elements and make them beautiful. TSS // Tell me a little about how your beauty line differs from your grandmother’s. TSS // Your collections contain so many different items – home decor, beauty, shoes, fragrance etc… What has been your favorite to create and why? 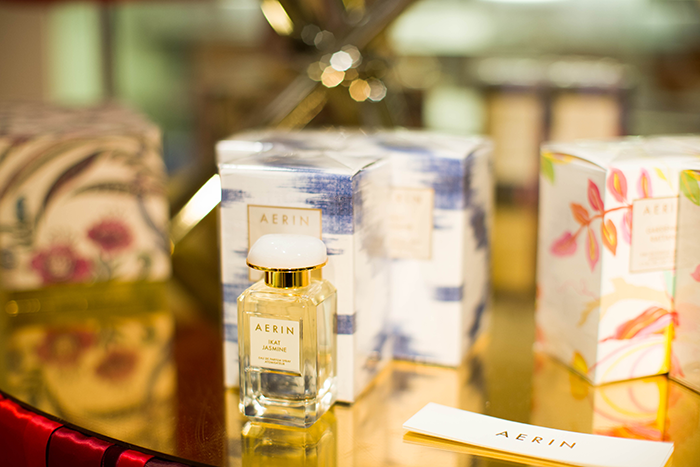 Aerin // Honestly it’s got to be the fragrance, because to me, fragrance is such a reflection and such an emotional product. You smell something and immediately know if you like it or don’t like it. I was talking to one beauty advisor and she said the Ikat Jasmin fragrance reminds her of growing up in Iran, while to me it reminds me of something totally different. I think scents are just a really fascinating thing and the fragrance collection is something I’m really proud of. TSS // How did you come up with these five different scents? Aerin // It was based on the factory trends such as rose – rose is something you’re really seeing everywhere now, people love roses, but how to do you it in a new, modern and unexpected way? For me, incorporating Cognac created something more sensual. Then also based on memories – I love Gardenia, but how do you make it different like putting it with orange blossom – it’s very different from your typical Gardenia scent. Lilac has green notes in it which makes it feel really springy. So it was really based on trends or directions we thought would be interesting. TSS // Which is your favorite out of the five fragrances? I do love Ikat Jasmine, that is the one that’s my go-to in the morning. I get up, brush my teeth, put Advanced Night Repair on, and a little spritz of Ikat Jasmin and it’s just, I love it. 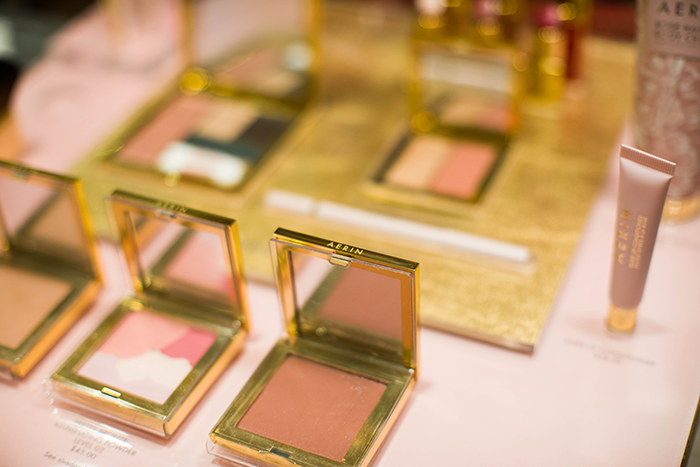 TSS // As the Style and Image Director for Estee Lauder AND the founder of AERIN, how do you do it all? You must be so busy! What are your essentials for keeping yourself organized on the go? TSS // What does your family have planned for the holidays? Aerin // We’re going to go skiing. We have a house in Colorado which actually inspired the Amber Musk fragrance and we’re going to be there for about a week. We go to Aspen – I first started going there with my uncle many many years ago. My family has always been an Aspen family and we’ve traveled everywhere but we always seem go back to Aspen. It reminds me of an old ski town and it’s very authentic, which I love. Lucky girl you are! I’ve got to go check out Ikat Jasmine. You are one lucky girl! Her products just look incredible. I would love to have them just for decorations. That’s awesome what a great opportunity loved your questions. I have such respect for smart, hardworking women, and Aerin definitely falls within that category. Thanks for sharing this insightful and inspiring interview!